Astilbes are an essential perennial, one of the real stars of the light shade garden. What gives them their power is the one-two punch of terrific bloom habit combined with great foliage. Blooms are plume-like, in a wide range of colors, mainly the white-to-pink-to red range, though I grow a peach-colored knockout the exact name of which I do not know. That’s what you get for dealing with an unlicensed vendor at a roadside stand outside of Madison, Wisconsin. Earnest socialist, one can only imagine. He did sell me three very healthy plants, to his credit. Foliage varies from long and oval to broad and lace-like. Most sport foliage that is a very attractive deep green, often serrated. Plants vary in size from twelve inches to a few reaching three feet. Bloom time is typically early summer. Deadheadng does not induce more bloom; in fact, the plants look best if flowers are allowed to develop into seedpods for fall interest. Astilbes like their soil on the humusy rich side, so work in extra organic matter. They are heavy feeders, so fertilize with a granular all-purpose (10-10-10) if your soil is neglected, I don’t have time right now to find out exactly why it is that your soil is neglected, you’re off the hook until a later date. One mistake some make is planting Astilbes in full sun, where they tend to curl up into crispy brown origami. There are a few varieties that do better in full sun than others, but in general, full sun for this plant is not a good idea. Nor is any semi-shady situation in which the soil is allowed to dry out. You grow Astilbe, you water them twice a week in periods of no rain, that’s just the way it is. They are greatly helped by summer mulch placed around their base, to keep soil moist and roots cool. They will bloom respectably in some pretty shady spots, but do not bloom well in full shade. Find a spot where they get an hour or three of direct sun, or dappled shade throughout the day, you’re laughing. Among my favorites: A. japonica ‘Rheinland’ (rose-pink); A. chinensis ‘Visions’ (raspberry-pink, cute and little); A. arednsii ‘Granat’ (deep red, wonderful purplish foliage in early season). 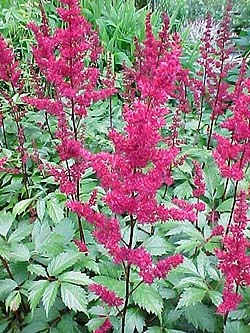 Astilbe combines well with most other part-shade plants, working particular magic when combined with hosta, pulmonaria, lamium, and asarum. Division is a good idea every three to four years, as you see the center area of the plant clearly die out. You see Astilbe listed as Zone 4 some places, Zone 3 others, consider all varieties worthwhile.